CAPDI© WORKS FOR YOUR BUSINESS! CapDI technology is used in many types of commercial applications, such as commercial laundry, automotive paint lines, agriculture and horticulture, and as a water softener for businesses and industries. CapDI delivers cleaner water that eliminates corrosion and scaling issues caused by hard water. The robust, reliable water treatment systems offered by Voltea incorporate fully automated self-cleaning with dynamic control ensuring the water produced is of consistent high quality, adjusting to varying concentration of feed constituents. WE DESIGN OUR SYSTEMS BASED ON THE TYPE OF APPLICATION AND REQUIRED WATER QUALITIES. Voltea equipment improves operational performance and lifetime of a wide range of industrial equipment. 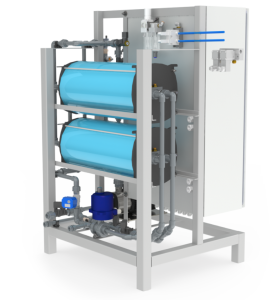 Our systems feature tunable deionization of water for industrial and commercial applications, while the compact footprint of Voltea’s modular IS systems design affords simple, containerized deployment. To date, we have deployed systems allowing up to 48 modules in a single 40 foot container, delivering over 537 m3 (142k US gallons) of deionized water per day. Ion exchange softeners require frequent regeneration, and when doing so release sodium and chloride into the water table. This damages the environment, is a health concern among those with sodium restricted diets, causes corrosion of piping infrastructure, and damages appliances. Voltea’s CapDI technology provides a water softening solution that is both user friendly and chemical-free. Fundamentally different than merely managing hardness in water, CapDI also extracts sodium and other ions. From small appliances to large commercial applications, CapDI is the obvious technology choice. Voltea’s IS systems have the ability to reclaim up to 95% of pre-treatment wastewater from automotive paint lines and other coating processes. To achieve the highest quality required of these coating lines, clean water is mandatory. CapDI placed after conventional particulate filtration methods tunably reduces TDS enabling automotive and other coating manufacturers to reduce their municipal water demand, as well as move toward a zero waste liquid discharge goal. These features, coupled with Voltea’s remote monitoring solutions minimize maintenance and allow manufacturers to focus on their core business of producing world-class automobiles and other high quality painted and coated products. The modular nature of the IS systems enable their placement line-side to processes, both incorporating into other pre-existing recycling systems, as well as offering stand alone operation. Wastewater effluent, or treated sewage effluent, is of little use to customers due to the level of dissolved salt in the effluent. CapDI installed after MBR or SBR systems enables customers to re-use the effluent for a variety of applications, such as cooling towers, boiler-feed, and irrigation for landscaping and golf courses. For these applications, CapDI recovers up to 95% of the effluent with minimal chemical and power usage. CapDI systems have been proven to operate efficiently on the effluent of municipal wastewater with minimal pre-treatment requirements. In commercial laundry, TDS levels above 750 ppm causes dull, gray linens, so effective use of recycled laundry water has been limited by the inability to affordably and reliably remove TDS at high temperatures. Current technologies, such as RO, require water to be cooled before TDS removal, which means it must then be reheated for laundering. This expensive, time-consuming process is no longer necessary with the addition of CapDI. The removal of TDS at laundering temperatures allows Voltea customers to realize exceptional operational, chemical, and energy costs savings. Commercial laundries across the globe have reduced their total water consumption significantly by implementing CapDI. This technology recovers up to 95% of the water it treats, delivering whiter, brighter linens at high temperatures (140°F/60°C). Voltea reuse solutions work across all laundry intakes; healthcare, hospitality, uniforms/industrial, and food & beverage. Voltea’s CapDI experts have developed technology and performance metrics so methodically that our predicted performance data graphics are near perfectly in-line with actual results of each system we install. This allows launderer’s to make accurate estimates of laundering times, water usage, and TDS removal while running the CapDI system. Similar data graphics are also made to represent each launderer’s current treatment system without CapDI, allowing detailed business case analysis to show just how effectively our technology can help the facility. In industrial applications, cooling towers use large quantities of water and chemicals. A cooling tower carries away heat through the evaporation of water. This water contains natural salts such as calcium, bicarbonate, chloride, and sulfate. The salts do not evaporate and build up over time, thus causing corrosion and scaling. To prevent this, traditionally chemicals are added to the cooling water. CapDI treats the water before it enters the cooling tower, reducing salts from the incoming water stream by 80%. The cooling tower does not need to be adapted since CapDI is placed before it, treating only the incoming water, therefore the composition of the recirculating water remains unchanged. This increases the cycles of concentration (COC) significantly, resulting in lower overall water consumption and wastewater production. Fewer scale and corrosion inhibitors are required to treat the water because of the decreased water consumption. For cooling systems that face existing problems with corrosion and scaling, CapDI is used to reduce the scaling and corrosion potential of cooling tower water. Once installed, CapDI is essentially risk-free since it does not change the chemical treatment program, the conductivity levels, or the settings of the cooling tower.